When it comes to filing bankruptcy, most people will choose between one of two types. Chapter 7 bankruptcy, also known as liquidation bankruptcy, is designed to completely clear your dischargeable debts, including credit card debt and medical bills. Chapter 13, on the other hand, is essentially a reorganization of your debts, in which a structured payment schedule is established. Since Chapter 7 bankruptcy involves completely wiping away much of your debt, there is a strict “means test” which dictates who is, and is not, eligible for a Chapter 7 filing. This test is primarily based off of your income and expenses, and will be used in the majority of cases. The first component of the means test is based solely on your income. The court will look at your average monthly income in the six months leading up to the bankruptcy filing. If this number is less than the Ohio median income for a household of your size, you will be eligible for Chapter 7. If your average monthly income is greater than the Ohio median income, the means test becomes much more complex. First, you must calculate your total income from all sources, including business income, income from rental properties, and much more. Once you’ve established your total income, you must calculate your total allowable expenses. These include food, household items, apparel, and others. From there, the court will look at the difference between your income and your expenses, and determine if you have enough money left over (disposable income) to make regular payments toward your debts. If you do, the court may deny Chapter 7 in favor of a Chapter 13 filing. While this means test is commonly used, it does not apply in all cases. If you are a disabled veteran, and your debts were primarily incurred during active duty, you will automatically qualify for Chapter 7. Likewise, people with primarily business debts, as opposed to consumer debts, can generally file for Chapter 7 with no issues. Considering Bankruptcy? Call (614) 410-6878. 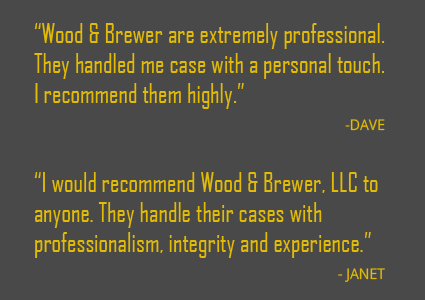 At Wood & Brewer, LLC, we take great pride in providing highly-personalized and effective legal solutions. We understand the stressful situation you may be in, and will do everything in our power to get you relief from debt when you retain our firm. Not sure if you qualify for Chapter 7? Contact our firm today at (614) 410-6878. In order to be eligible to file for Chapter 7 bankruptcy in Columbus, Westerville, or the surrounding areas, you must pass the means test.